High wall Spillguards offer 100% secondary containment and are available in sizes from 20′ x 52’ to 40′ x 52’ with a 3’ wall. 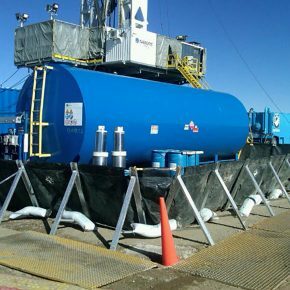 This system meets or exceeds Spill Prevention Control and Countermeasure regulations for secondary containment requirements. The fuel and chemical resistant liner offers bulk liquid containment and can be quickly deployed on your jobsite.